Happy Halloween everyone! This is my last Halloween manicure tutorial of the year. So I know that you are probably going to be munching on candies and chocolates no matter how old or young you are. What's more suitable than candy corn on your claws? Here's the triple striped look we're going for. Weeeeeee, candy fingers! 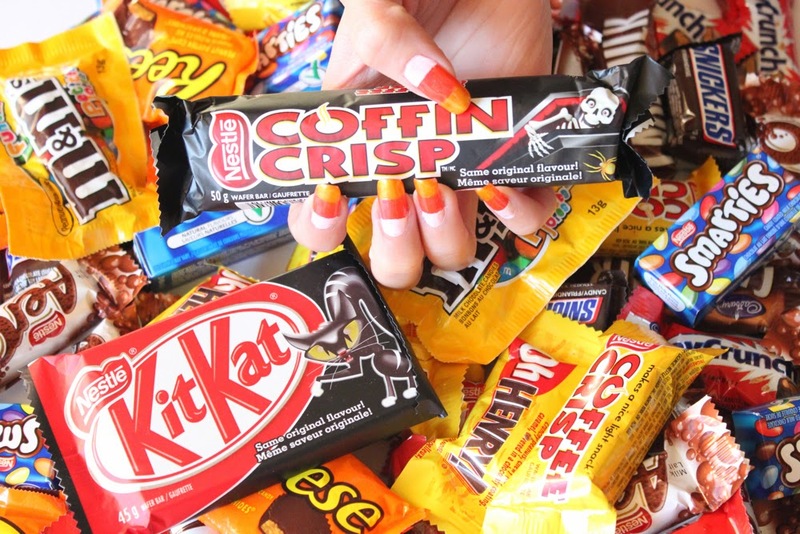 Enjoy your treats, Happy Halloween!! The other day, when I was working on the Dexter Manicure Tutorial, I really couldn't decide whether I wanted the blood to drip up or down my nails. For that reason, I decided to make a tutorial for the opposite direction but with slime rather than blood. Here's the look we're going for. Slime dripping from your cuticles...how attractive. -A baggy. Sandwich or zip lock - doesn't matter. 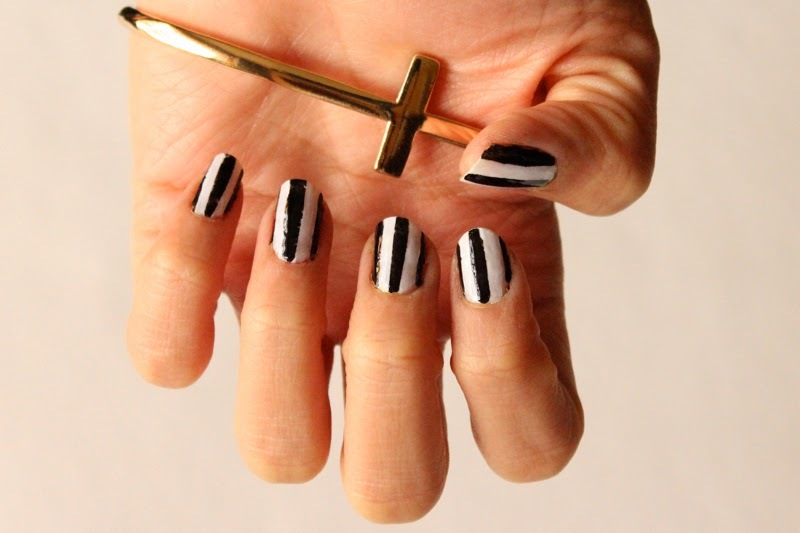 So today's tutorial is for a striped nails but they're not just for Halloween...seriously. Quite simple and you could fully mix-up the colour combinations! Here's the look. Just black & white stripes. Paint one coat of white nail polish. Do a second coat when the first coat is dry. Cut thin strips of tape. It's all up to you whether you would like super thin or thick stripes. I opted for 5 stripes per nail which means two pieces of tape per finger. I snipped the tape lengthwise rather than widthwise because the tape wasn't wide enough for my nails. Ensure that your nails are completely dry otherwise the tape may damage your base colour.